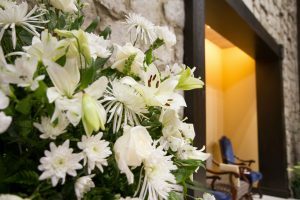 Our Art and Environment ministry uses floral designs and the placement of sacred art to complement each liturgical season. The committee is open to all parishioners interested in assisting with the seasonal decoration of the church. It also invites parishioners with a love of flowers and/or an interest in floral design to assist with altar flower arrangements and maintenance of flowers placed in the church. It accepts donations for weekly altar arrangements In Honor of or In Memory of individuals or family members. For more information or to put your decorating skills to work, contact our Art and Environment ministry. Donate towards Altar flowers in honor of, or in memory of, a loved one.